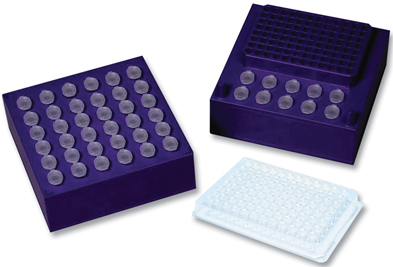 The CoolCube is designed to store samples safely on the lab bench without sample degradation due to temperature increase or fluctuation. Constructed of DuraStar (a high strength polymer) and a patented gel refrigerant, the CoolCube maintains temperature at approximately 0°C for up to four hours. Simply place the CoolCube in a freezer overnight and it's ready for use, keeping samples cool and safe at the bench, without messy ice buckets or wet tubes. One side of the CoolCube can be used as a convenient PCR workstation with wells for 12 standard 1.5/2.0ml microtubes and one 96-well PCR plate or 0.2ml tubes/strips. The other side can be used to hold 36 standard 1.5/2.0ml microtubes. PCR process is covered by patents owned by Hoffman-LaRoche.